Hello lovelies! 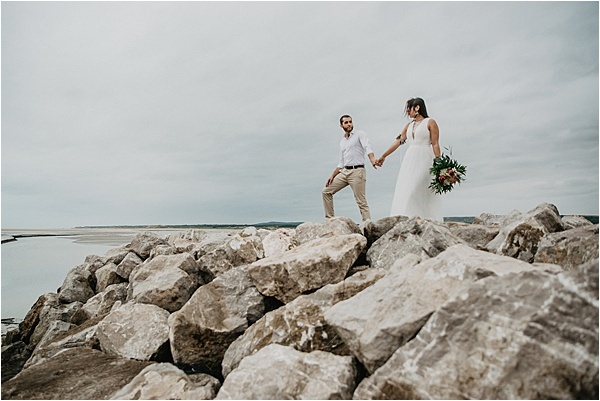 If you and your partner are looking for an adventurous venue where the countryside and sea meet, come and explore this windswept, adorable inspirational wedding shoot in The Bay of Canche at Le Touquet-Paris-Plage. 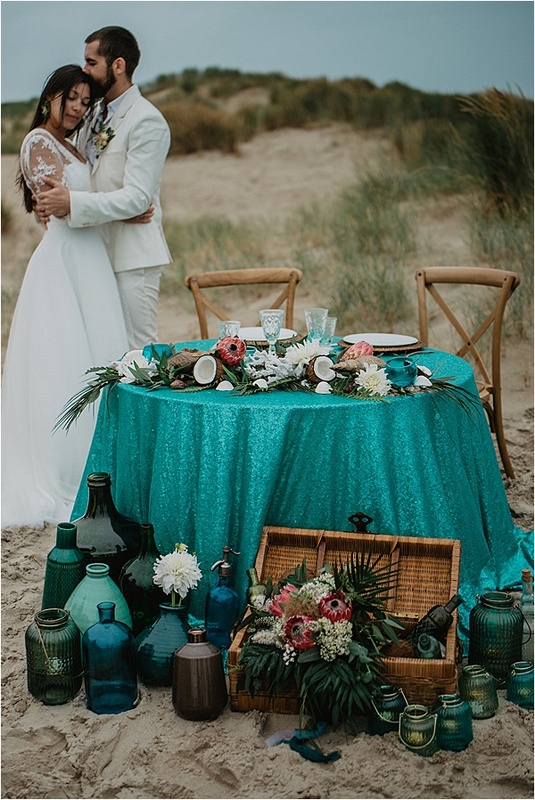 This picturesque spot with an amazing sea breeze feel and opalescent shades is just incomparably romantic. 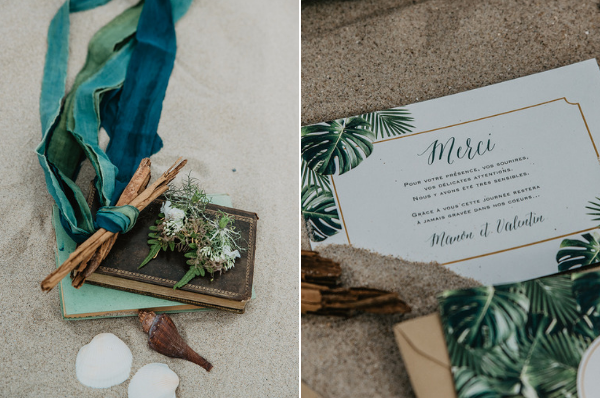 We can’t deny this beauties, captured by Morgane Ball Photography, offer a tone of inspirations for any beach wedding ideas. 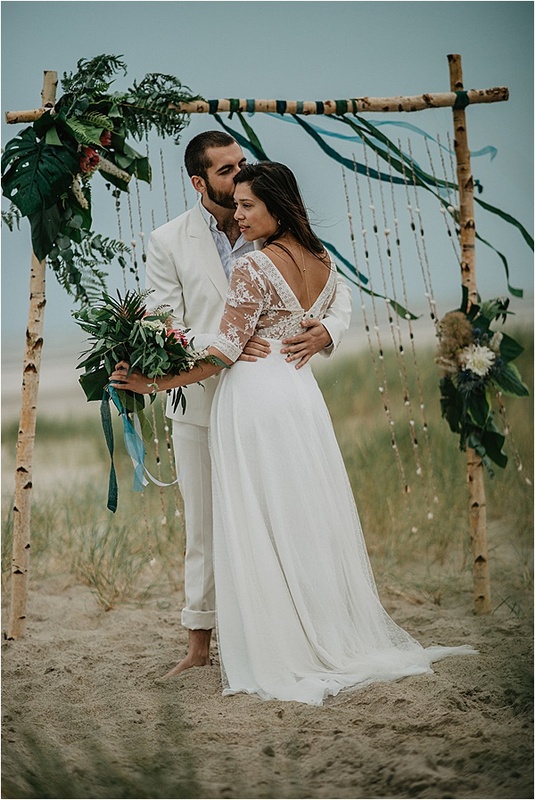 This styled photo shoot is brought to FWS HQ by a very talented wedding planner La Petite Brune. 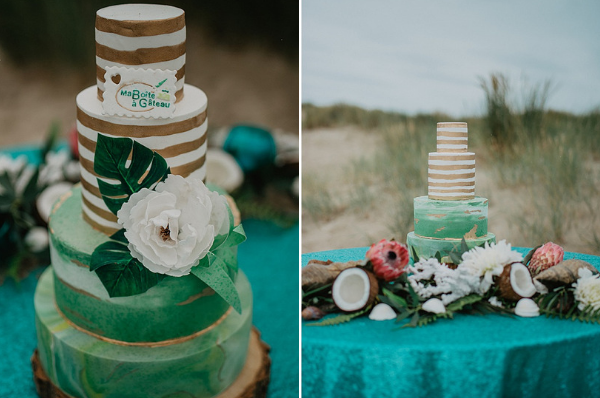 Inspired by their desire to create an authentic tropical atmosphere, yet with a stylish French touch, their team brought glamorous style and fun details to the shores of The Bay Canche. 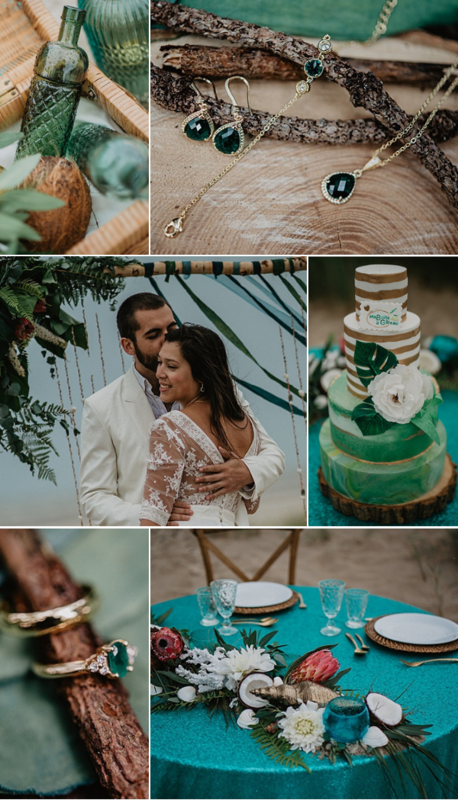 The shoot was likened to the colors of the Caribbean Sea, as well as the colors of the Maya tropical forest. La Petite Brune mixed the luxuriant atmosphere with sensuality, intensity and wild passion. Such a fitting demonstration where nature takes back its rights! 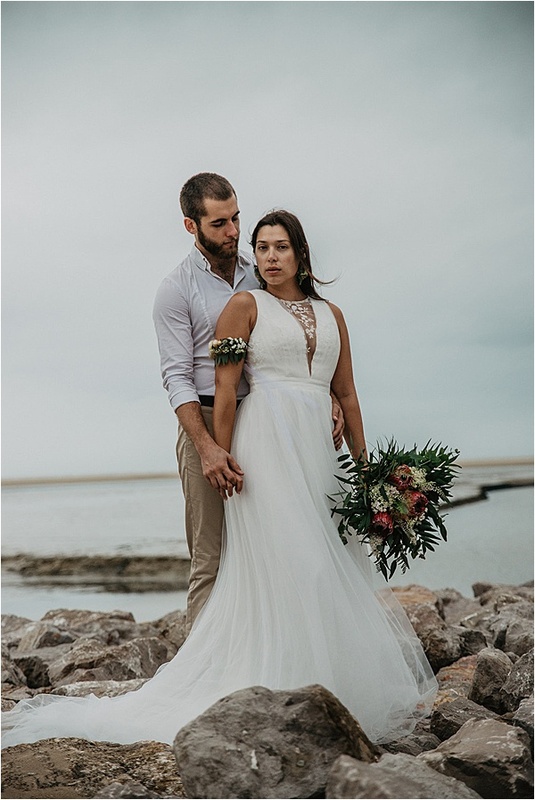 Wedding dress is by Lambert Créations while the grooms outfit is by Love is Like a Rose. 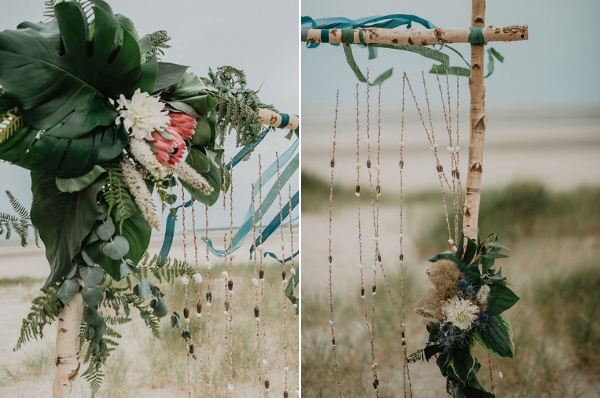 The atmosphere is sensual and romantic – our sweet couples whose in love tie the knot in the beach, near of an arch where hanged garlands of shells and ribbons, and where the vegetation embrace the blue color of the sea. 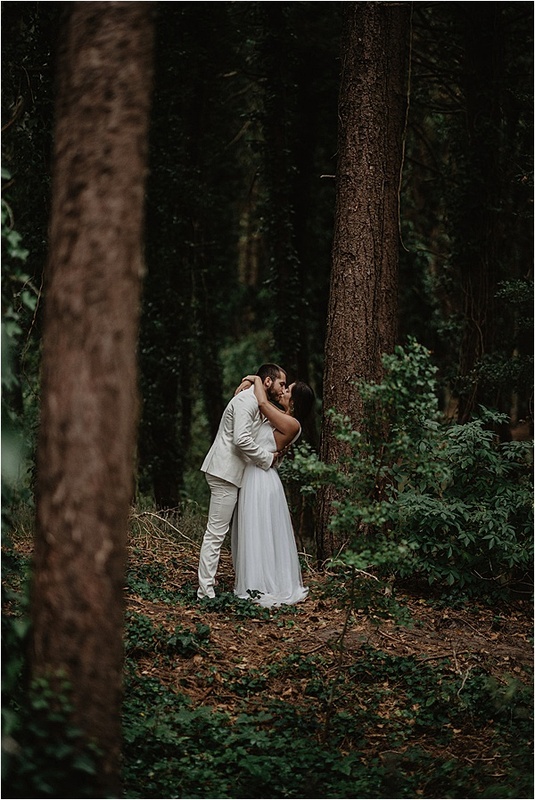 The bride and groom are connected with the nature. 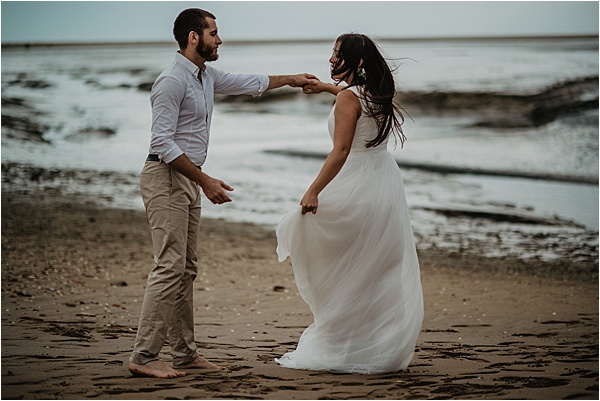 In this intimate sanctuary, we see a celebration of union between two souls in front of four elementary elements : water, sand, wind, and the sun. The love and the energy they release are in perfect balance with the nature. Decorations are provided by Ma Déco aux Petits Oignons and flowers essentials by Frédérique Bougel. Delicious cake tops the event by Ma Boîte à Gâteau. 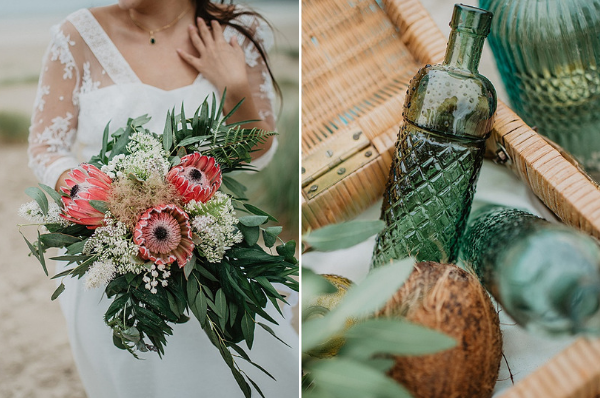 The blend of blue sequins and natural elements such as sand, coconut, shells and white coral, as well as glass and terracotta, all enhanced by a tropical vegetation, bring a captivating romantic atmosphere. These accessories where supplemented by Atelier Sarah Aime, Zeina Alliances, and L’Art du Papier. 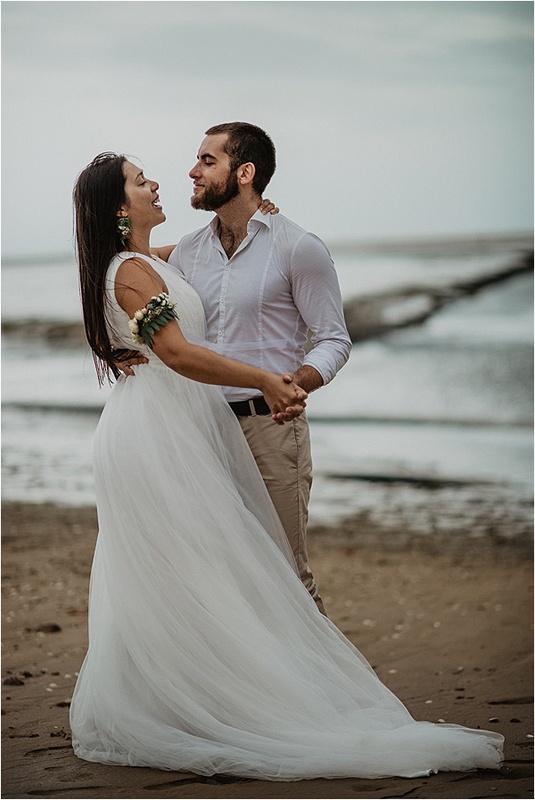 There’s nothing quite like a wedding shoot with so many wonderful ideas flowing!